Pepper plants belong to the magnoliids, which are angiosperms but neither monocots nor eudicots. Their family, Piperaceae, is most closely related to the lizardtail family (Saururaceae), which in fact generally look like smaller, more delicate and amphibious pepper plants. Both families have characteristic tail-shaped inflorescences covered in tiny flowers. A somewhat less close relative is the pipevine family (Aristolochiaceae). A well-known and very close relative – being also part of the Piperaceae – are the radiator plants of the genus Peperomia. The scientific name Piper and the common name "pepper" are derived from the Sanskrit term pippali, denoting the long pepper (P. longum). Piper species have a pantropical distribution, and are most commonly found in the understory of lowland tropical rainforests, but can also occur in clearings and in higher elevation life zones such as cloud forests; one species (Japanese Pepper, P. kadsura, from southern Japan and southernmost Korea) is subtropical and can tolerate light winter frost. Peppers are often dominant species where they are found. Most Piper species are either herbaceous or vines; some grow as shrubs or almost as small trees. A few species, commonly called "ant pipers" (e.g. Piper cenocladum), live in a mutualism with ants. The fruit of the Piper plant, called a peppercorn when it is round and pea-sized, as is usual, is distributed in the wild mainly by birds, but small fruit-eating mammals – e.g. bats of the genus Carollia – are also important. Despite the high content of chemicals that are noxious to herbivores, some have evolved the ability to withstand the chemical defences of pepper plants, for example the sematurine moth Homidiana subpicta or some flea beetles of the genus Lanka. The latter can be significant pests to pepper growers. Many pepper plants make good ornamentals for gardens in subtropical or warmer regions. Pepper vines can be used much as ivy in temperate climates, while other species, like lacquered pepper (P. magnificum) grow as sizeable, compact and attractive shrubs with tough and shiny leaves. Smaller species, like Celebes pepper (P. ornatum) with its finely patterned leaves, are also suitable as indoor pot plants. Unsustainable logging of tropical primary forests is threatening a number of peppers. The extent of the effect of such wholesale habitat destruction on the genus is unknown, but it is to be noted that in the forests of Ecuador – the only larger region for which comprehensive data exists – more than a dozen species are known to be on the brink of extinction. On the other hand, other Piper species (e.g. spiked pepper, P. aduncum) have been widely distributed as a result of human activity and are a major invasive species in certain areas. For other spices called "pepper", see Pepper (disambiguation). Use of peppercorns as pungent spice is significant on an international scale. In classical antiquity, there was a vigorous trade of spices including black pepper (P. nigrum) from South Asia to Europe already. The Apicius, a recipe collection complied about 400 AD, mentions "pepper" as a spice for most main dishes. 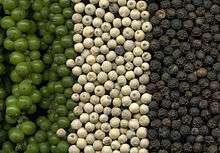 Judging from the Apicius, in the late Roman Empire, black pepper was probably still expensive, but nevertheless seems to have been available readily enough to be used more frequently than salt[lower-alpha 1] or sugar. [lower-alpha 2] As Europe moved into the Early Middle Ages, trade routes deteriorated and the use of pepper declined somewhat. Due to the wide distribution of Piper, the fruit of other species are also important spices, many of them internationally. Mecaxochitl (P. amalgo) was used by the Aztecs to spice up cocoa. Cubeb (P. cubeba), also known as tailed or Javan pepper actually played a major role in Early Modern Era spice trade; ocet kubebowy, cubeb-flavored vinegar, was a popular condiment in 14th century Poland. But reputedly Philip IV of Spain at the end of the 1630s suppressed trade in cubeb peppercorns to capitalize on his massive share of the black pepper trade. After a brief comeback as a medical plant, Cubeb is nowadays fairly obscure in the West. It is however a most significant spice around the Indian Ocean region today, and popular as far as Morocco where it flavors spicy-sweet markout pastry and is sometimes included in the famous ras el hanout mix. Further east, it is well-loved across Indonesia, where it is the popular pepper to use in gulé (curried stews). West African pepper (P. guineense), also given a variety of "regionalized" names like "Benin pepper", "Ashanti pepper, or the rather ambiguous "Guinea pepper", is considered supreme for use in stews and other regional specialties. It is used in addition to black pepper to impart a particularly refined aroma with hints of nutmeg and saffron. Sometimes it is used in the East African berbere spice mix. This species, despite being traded more extensively in earlier times, is very hard to get outside Africa today. 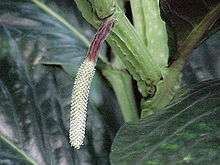 More readily available in the West is long pepper (P. longum), commonly traded under its Indian name pipalli. This is possibly the secondmost popular Piper spice internationally; it has a rather chili-like "heat" and the whole inflorescence is used as the fruits are tiny. Not only the seeds of Piper are used in cooking. West African Pepper leaves, known locally as uziza, are used as flavoring vegetable in Nigerian stews. In Mexican-influenced cooking, hoja santa or Mexican pepperleaf (P. auritum) has a variety of uses, mainly to impart flavor too. In Southeast Asia, leaves of two species of Piper have major importance in cooking: lolot (P. lolot) is used to wrap meat for grilling in the Indochina region, while wild betel (P. sarmentosum), often seen under the Thai name cha phlu, is used raw or cooked as a vegetable in its own right in Malay and Thai cuisine; it is also used to prepare the famous miang kham snacks of northwestern Thailand. Cubeb (P. cubeba) has been used in folk medicine, herbalism and related fields (e.g. alchemy, folk magic or exorcism), as well as, particularly in the early 20th century, as a cigarette flavoring. P. darienense is used medically by the Kuna people of the Panama-Colombia border region, and elsewhere it is used to intoxicate fish which then can be easily caught. Spiked pepper, often called "matico" (Except in Ecuador, where that name is used for Aristeguietia glutinosa), appears to have strong disinfectant and antibiotic properties. Black pepper (P. nigrum) essential oil is sometimes used in herbalism, and long pepper (P. longum) is similarly employed in Ayurveda, where it was an ingredient of Triphala Guggulu and (together with black pepper) of Trikatu pills, used for rasayana (rejuvenating and detoxifying) purposes. See also betel leaf, kava culture. One Piper species has gained large-scale use as a stimulant. Betel (P. betle) leaves are used to wrap betel palm nut slices; its sap helps release the stimulating effect of these "cookies" which are widely known as pan in India. Inversely, another Piper species is used for its depressant effects. In the Pacific region, where it has been widely spread as a canoe plant, kava (P. methysticum) is used to produce a calming drink somewhat similar to alcohol and benzodiazapines but without many of the negative side effects and less of an addiction risk. It has also become popular elsewhere in recent decades, and is used as a medical plant. However, pills that contain parts of the whole plant have occasionally shown a strong hepatotoxic effect, which has led to the banning of kava in many countries. On the other hand, the traditional preparation of the root as a calming drink appears to pose little, if any, such hazard. Piper is a model genus for research in ecology and evolutionary biology. The diversity and ecological importance of the genus makes it an obvious candidate for ecological and evolutionary studies, though not surprisingly, most research has focused on the economically important species P. nigrum (black pepper), P. methysticum (kava), and P. betle (betel). Important secondary metabolites found in pepper plants are piperine and chavicine, which were first isolated from Black Pepper. The piperidine functional group is named after the former, and piperazine (which is not found in P. nigrum in noticeable quantities) was in turn named after piperidine. The species called "Piper aggregatum" and "P. fasciculatum" are actually Lacistema aggregatum, a plant from the family Lacistemataceae. ↑ Apicius generally uses garum fish sauce instead; raw brine and large quantities of herbs were also employed by many. ↑ Crystal sugar was about as expensive as precious metals and even to the wealthiest people less available than diamonds are today. Apicius uses honey and caroenum (grape must concentrate). ↑ International Union for the Conservation of Nature and Natural Resources (IUCN) (2007): 2007 IUCN Red List of Threatened Species. IUCN, Gland. ↑ Chester F. Gorman (1969). "Hoabinhian: a pebble tool complex with early plant associations in Southeast Asia". Science. 163 (3868): 671–673. doi:10.1126/science.163.3868.671. ↑ Chester F. Gorman (1971). "The Hoabinhian and after: subsistence patterns in Southeast Asia during the Late Pleistocene and Early Recent periods". World Archaeology. 2 (3): 300–320. doi:10.1080/00438243.1971.9979482. JSTOR 124120. ↑ John Parkinson (1640). Theatrum Botanicum: the Theater of Plants. London: T. Cotes. ↑ Charmaine Solomon (1998). "Cha plu". Encyclopedia of Asian Food. Periplus Editions. ↑ "Tropical root crops". Earthcare. 2008. Retrieved 15 July 2008. Wikimedia Commons has media related to Piper.